• Clear and discreet – ideal for use in open toed sandals. Fits discreetly in Shoes. Pain in the balls of your feet? 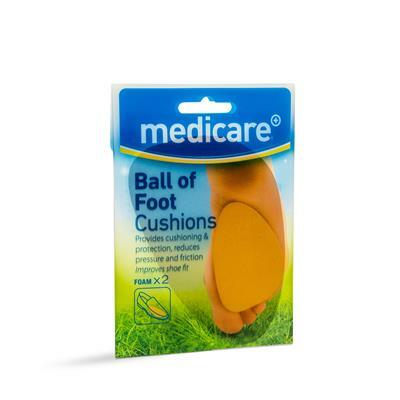 Medicare Ball of Foot Gel Cushions provide added comfort for the ball of the foot, relieving pain-causing pressure and friction. It is quite common to experience pain in the metatarsal region (the area just before the toes, more commonly referred to as the ball-of-the-foot). This common foot disorder can affect the bones and joints at the ball-of-the-foot and can cause a person a great deal of pain and discomfort. The cause of increased pressure in this part of the foot can be either due to anatomic differences or external factors, such as footwear. There are a number of conditions that can cause pain in the ball of the foot. These conditions can include anything from arthritis to infection to a fracture or ligament tear. The Medical Ball of Foot Gel Cushion is ideal for people who are on their feet for prolonged periods of time. The transparent, gel material ensures discretion, even for Summery types of footwear like sandals and open toed shoes. The cooling gel material provides cooling comfort and feels good against the skin. These extra soft gel cushions absorb painful shocks and helps reduce burning sensations.